Honey bees are docile when they swarm. These bees were resting under a picnic table while waiting for scout bees to find their new home. They were easily relocated to a managed apiary nearby. Swarms are natural and usually occur in late spring to early summer. Bees are not aggressive when they are swarming so there is no need to be fearful of stinging incidents. Swarms occur when honey bee numbers in the hive have increased to the point that there is not enough room for the expanding population. 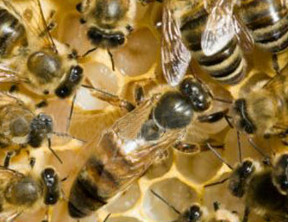 The queen bee produces a pheromone (chemical scent) called queen mandibular pheromone that workers pass along from one to the other, letting each other know that the colony is "queen right". When bees are too crowded the scent does not reach the outer workers and they begin to raise a new queen. As the new queen is about to hatch, scout bees look for a new home. When they find a suitable location the old queen leaves the hive along with about 70% of the worker bees, to begin a new colony. This is a nature's way of reproduction for the social honey bee.